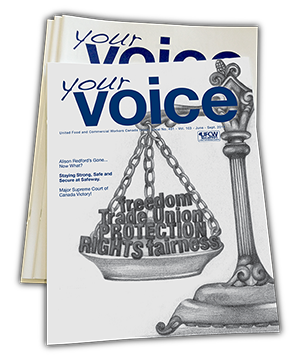 UFCW Local 401 would like to welcome you to Your Voice, a publication you can look forward to receiving 3 times a year. The purpose of this magazine is not only to engage our membership in the activities of the union, but also to inform the members on the wide range of issues we take on. We’re an active union that is constantly seeking to improve the lives of all who belong to Local 401 and as a result, raise living standards for all Albertans. After all, unions don’t just benefit those who pay dues. Being part of the labour movement means working together to improve the lives of all workers.